North Shore Medical Centre operates on an appointment system. Every effort will be made to accommodate your preferred time with the doctor of your choice. Standard Consultations - are up to 15min for one patient and generally cover only the one health concern. Long Consultations - are recommended for complex health concerns, counselling and surgical procedures that may also require a nurse's assistance. Therefore, please advise reception of your needs when booking to ensure an appropriate appointment time is booked. If in doubt please ask! Reception staff will endeavour to contact you if your doctor is away. If you are unable to attend your appointment, please notify us in advance (preferably 24hrs) if you are unable to attend. Failure to attend appointments is noted and may result in non-attendance fees being charged. Home visits - are available for our regular patients based on need and doctor availability. Please ring the surgery for details. Whatever your preferred language, we can help you organise an interpreter to assist with any language barriers. 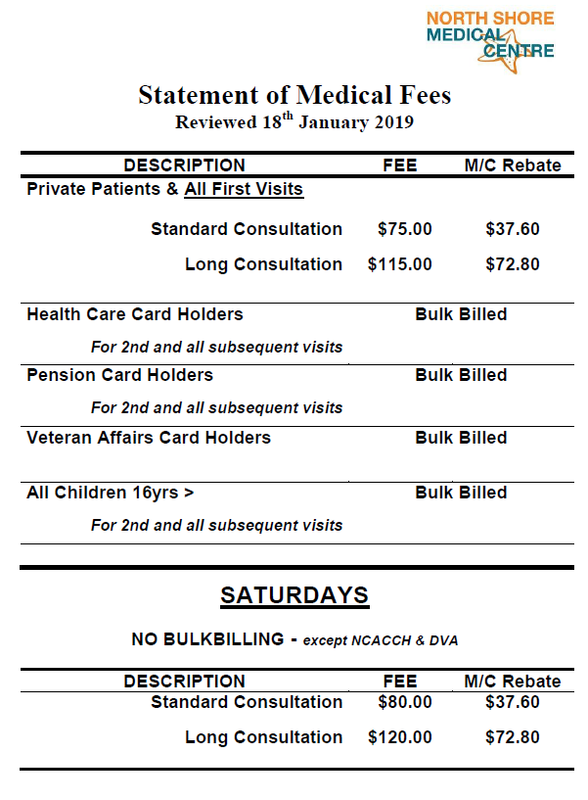 North Shore Medical Centre uses TIS national (Translating and Interpreting Service) - for more information click here. Our Doctors may be contacted during normal surgery hours. If the Doctor is already in consultation with another patient, a message will be taken and reception will advise when the doctor may be able to return your call. If your call is an emergency please communicate the nature of this emergency to reception and every endeavour will be made to put you through to a Doctor. We encourage our patients to ring for their results. Note you will only be called by the surgery if the Doctor has marked your results as requiring a "Recall" appointment. Please be aware, staff are not authorised to give test results or medical advice over the phone without the doctors explicit direction. North Shore Medical Centre is a mixed billing practice. As this practice strives for excellence and maintains high medical accreditation standards, our fees reflect the quality of our care. Payment when charged, is due at time of consultation and can be made via cash, credit card or eftpos. Please note we can refund your Medicare rebate directly back to your account if your banking details are registered with Medicare. Incoming reports and results are checked by our doctors on a daily basis and those requiring follow-up will be marked for a "Recall" appointment by the doctor. These "recall" lists are followed up daily and every attempt is made to schedule a timely appointment. It is vital therefore that we not only have your current contact details but also an alternative emergency contact should you not be available. Your doctor may also place "Reminders" in your file regarding due dates for certain preventative health reviews, tests or other additional follow-up actions required. Periodically you will be contacted via SMS and/or Phone as and when these "Reminders" are due. Please let your doctor know if you do not wish "Reminders" to be sent to you. This practice is committed to protecting the privacy of patient information and to handling your personal information in a responsible manner, in accordance with the Privacy Act 1998, the Privacy Amendment Act 2012 and relevant state and territory privacy legislation. We hope to provide a professional, quality and caring medical service for our patients. If you have any concerns, suggestions or complaints regarding any aspect of our service, we would appreciate hearing from you and take your feedback seriously. If you feel there is a problem that you would rather discuss outside of the practice, you may prefer to contact the Queensland Government Centre for handling complaints. From time to time we will invite patients to complete questionnaires expressing your views on the practice and how we could improve. These surveys help us to continually improve our services and are completely confidential.